This coming Saturday’s Really Really Free Market will follow hot on the heels of Halloween. That’s why it will feature the Haunted Gazebo and Ballot Box Piñata—representative democracy is getting scarier by the day! 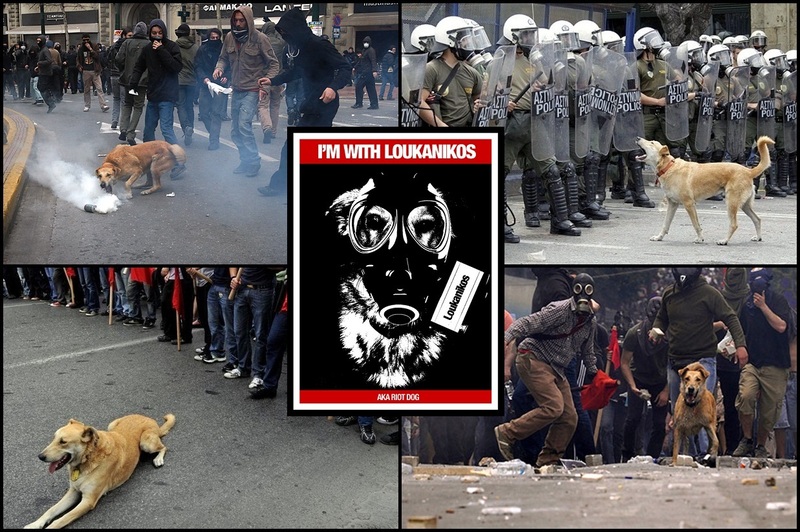 But Saturday is also the Day of the Dead—so RRFM participants will also be setting up a small memorial to Loukanikos, the world-famous “riot dog” of Athens, Greece who recently passed away. From 2008 to 2012, Greece experienced massive protests against capitalist austerity programs. Loukanikos, a street dog living in downtown Athens, was always at the forefront of these clashes, taking the side of demonstrators against the riot police. Undaunted by tear gas, loyal to friends and comrades even in the face of rubber bullets and concussion grenades, he set an example of cross-species solidarity—showing that the struggle against authoritarian governments and economic frameworks is of pressing concern not only to humans but to all life on earth. It’s not strange, after all, that man’s best friend would be capitalism’s worst enemy! The memorial will present photographs of Loukanikos in action, including a slideshow of important events from his life. In the spirit of the Really Really Free Market, we will also freely distribute pins bearing his likeness. From Athens, Greece to Carrboro, NC, may our resistance be as transnational as capital! In other news, don’t miss the encore appearance this Saturday of Fed Up!—a new group determined to provide free gourmet meals at all the Triangle Area’s Really Really Free Markets!